TL and I recently got some new wheels, and I can't believe I forgot to post a lil blog about it! 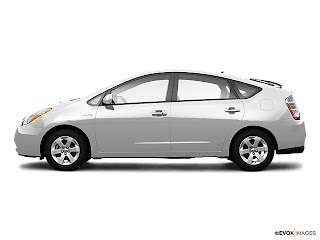 We got a 2009 Toyota Prius.. and it is completely awesome. TL got it the same day that Baby Ryan was born two weeks ago... and already we have put over 1200 miles on that sucker! It happens quickly when you drive back and forth to the bay a lot like we do :) The best part of it all is that we just filled up with gas for the 3rd time today - and it wasn't even empty yet! It averages 45-50 miles per gallon, which is so awesome! Especially compared to the SUV he had before. His last car was "lemon lawed", which I didn't even know was possible - so after a year of owning it and 25000 miles, the dealership cut him a check for just about what he paid for it and TL literally walked down the road to Toyota and purchased this! The navigation is cool, and we decided against leather seats this time because we thought the fabric would be more comfortable, and it is! It is a wonderful ride... so far I would say I highly recommend it! congrats on the new car, it looks great! and it sounds very environment-friendly, which is amazing. enjoy and be safe! What a Great car! It's 360 degrees captivating!!! - I luv it!